(NaturalNews) MY HEART GOES OUT to those injured in this morning's NJ train accident. My hope for all Americans is that we can all live in a safer, more just and more free society. To make sure Hillary Clinton wins the nomination, I wouldn't put it past James Comey to order the FBI to carry out an act of mass murder against the American people so they can blame Donald Trump. Watch for bombings of bridges, ports, airports, tunnels, railroads, ferries or other transportation infrastructure that the FBI just loves to target with its false terror plots. Many readers are asking me, "Is this the false flag you were warning about?" My answer is no. It's most likely just an accident. Although this could have very easily been carried out by the FBI in order to distract America from all the damning revelations about FBI head James Comey being a corrupt Clinton operative -- see this Breitbart.com article -- this train wreck is far too small for Obama to scrub the election. The kind of false flag I'm warning about would be much larger and would involve far higher casualties... in the thousands. 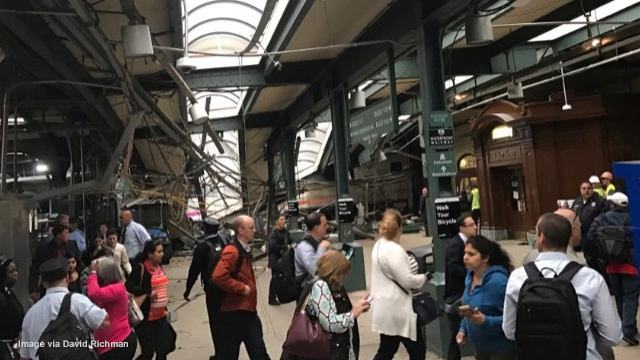 The NJ train wreck, although extremely tragic and sad to witness, simply did not reach the scale of carnage that globalists typically pull off to achieve much larger political goals. The attacks of 9/11, for example, were allowed to be carried out by the Bush administration in order to push the Patriot Act into law (which legalized the police state surveillance of all Americans... which was covered up and denied by the entire media until the Snowden revelations exposed the truth). We now know several things about 9/11 that were suppressed at the time: 1) The Saudis were the masterminds of the attack. 2) The third building (WTC7) was brought down with controlled demolition (meaning it was obviously pre-planned). 3) The Bush administration deliberately stood down America's military defenses to allow the attack to succeed, then leaped on the attack as an excuse to roll out a surveillance police state. The kind of scale that would have to pulled off in a false flag operation today would mirror the scale of 9/11. For corrupt government globalists to achieve their goals in such false flag attacks, they have to cause mass casualties and, importantly, also cause extreme disruption of economic activity for the nation. Only then can the government justify "big" things like passing the Patriot Act or delaying a presidential election. As I've stated before, the risk of a large false flag attack against America rises inversely to the plummeting of Hillary's poll numbers. The more likely Trump wins, in other words, the more likely the globalists activate their false flag plans to delay the election, execute candidates or unleash nationwide martial law. Watch the polls and you'll instantly know the risk of a large-scale 9/11-class event being given a green light in another American city. When the real false flag attack comes, you won't have to ask, "Was that it?" If the globalists really do attempt to halt this election in the next 40 days -- and I think there's a solid chance they will -- the kind of false flag even they'll pull off will be so huge and so deadly that you won't have any doubt what you're witnessing. 4) SEVERE ECONOMIC DISRUPTION: It must cause severe economic disruption of large enough scale that President Obama would be justified in delaying the presidential election until people can get back on their feet. This will be accompanied by Obama's heartfelt speech about how he has to "protect democracy from terrorism" and thus reschedule the election to a later day. 5) BOMBERS STILL AT LARGE: To justify the martial law and police state presence after such an event, the narrative must claim "the bombers are still at large." And by "bombers," I mean whoever is claimed to pull off the event. It could be radiological terrorism, biological terrorism, chemical bombings, etc. But whoever is blamed for it all must remain "at large" for quite some time so that the American sheeple get used to police checkpoints all over the police in the so-called "hunt for the bombers." Remember, when the totalitarian police state is really unleashed on the masses, most people will BEG FOR IT because they have been psychologically terrorized by the media into a state of obedient fear. If Obama starts talking about "protecting American democracy against terrorists" by moving the election date, you've just witnessed a false flag operation. If you are told to "shelter in place" instead of going out and voting, you've just been punked by a false flag operation. If you hear that the election has been postponed or rescheduled, you're witnessing the aftermath of a false flag. WE ARE FORTUNATE SO FAR in the realization that the more dire predictions about catastrophic events have not yet come to pass. Some of my own sources are astonished that nothing dire has yet happened. As I've stated multiple times, if we make it to election day with our democracy intact and both candidates still alive, we should count our blessings (and then vote the crooks out of office). Yet I'm also old enough, wise enough and experienced enough to know that the globalist puppets who really run this world almost never leave elections up to the voters. There is nothing they won't try to halt this election if it looks like Trump is going to win. This NJ train wreck, however, isn't anywhere near the scale of attack that would qualify as an election disrupting false flag. It's probably just an accident by another medicated train operator whose on antidepressant drugs. That's all based on what we know so far. If new information comes to light that warrants a change in this conclusion, I will of course update my assessment. But based on what we know right now, this looks like nothing more than another unfortunate train operator accident.